The Juno Awards were held in St. John's Newfoundland this past weekend, in spite of all the problems caused by Eyjafjallajokull volcano in Iceland. A pre-awards ceremony was held on Saturday, and then a larger ceremony on Sunday night which was broadcast. Michael Bublé was the weekend's big winner picking up four awards. He received the Pop Album of the Year honour for his album Crazy Love on Saturday night, and then on Sunday won Album of the Year, Single of the Year for “Haven’t Met You Yet” and the fan-voted Juno Fan Choice Award. His producer Bob Rock took Producer of the Year for his work on Buble's album. Other multiple winners on the weekend included Metric, Drake and K'naan. This is an indication that the Junos are catching up with the times and more in tune with current tastes. Teen idol Justin Bieber went home empty-handed even though he was nominated for Album of the Year, New Artist of the Year and Pop Album of the Year. Nonetheless, he was clearly the fan favourite as the crowd screamed at the mere mention of his name. Many of the artists missed one or both days because of the air traffic chaos. Those who were there hurried out when they heard news that volcanic ash was drifting from Iceland and would ground flights for the following few days. Those who took part in the ceremonies did their best, but with the lack of a host, it made both nights often very dull. Album of the Year: Michael Bublé, Crazy Love. Juno Fan Choice Award: Michael Bublé. New Artist of the Year: Drake. Songwriter of the Year: K'naan. Group of the Year: Metric. Single of the Year: Michael Bublé, Haven't Met You Yet. Rap Recording of the Year: Drake, So Far Gone. 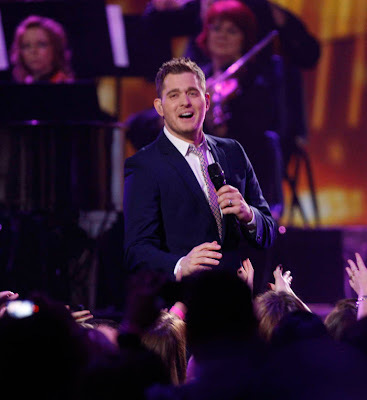 Pop Album of the Year: Michael Bublé, Crazy Love. Rock Album of the Year: Billy Talent, III. International Album of the Year: Kings of Leon, Only by the Night. Artist of the Year: K'naan. Adult Alternative Album of the Year: Joel Plaskett, Three. Vocal Jazz Album of the Year: Ranee Lee, Ranee Lee Lives Upstairs. Traditional Jazz Album of the Year: Terry Clarke, It's About Time. Instrumental Album of the Year: Bell Orchestra, As Seen Through the Windows. Francophone Album of the Year: Andrea Lindsay, Les sentinelles dorment. Children's Album of the Year: Norman Foote, Love My New Shirt. Classical Album of the Year, Solo or Chamber Ensemble: Joel Quarrington, Joel Quarrington: Garden Scene. Classical Album of the Year, Large Ensemble or Soloist(s) with Large Ensemble Accompaniment: Alain Levefre & London Mozart Players, Mathieu, Shostakovich, Mendelssohn: Concertino & Concertos. Classical Album of the Year, Vocal or Choral Performance: Adrianne Pieczonka, Adrianne Pieczonka sings Puccini. Classical Composition of the Year: Marjan Mozetich, Lament in the Trampled Garden. Dance Recording of the Year: Deadmau5, For Lack of a Better Name. R&B/Soul Recording of the Year: Jacksoul, Lonesome Highway. Reggae Recording of the Year: Dubmatix ft. Prince Blanco, Gonna Be Alright. Roots & Traditional Album of the Year, Group: Good Lovelies, Good Lovelies. Blues Album of the Year: Jack de Keyzer, The Corktown Sessions. Contemporary Christian/Gospel Album of the Year: Matt Brouwer, Where's Our Revolution. Jack Richardson Producer of the Year: Bob Rock,Haven't Met You Yet/Baby (You've Got What it Takes ) (Michael Buble, Crazy Love ). Recording Engineer of the Year: Dan Brodbeck, Apple of My Eye/Be Careful (Dolores O'Riordan, No Baggage ). Recording Package of the Year: Martin Bernard (art director), Stephane Cocke (photographer), Thomas Csano (designer/illustrator) — Beats on Canvas, Beats on Canvas. Video of the Year: Marc Ricciardelli, Little Bit of Red (Serena Ryder). Music DVD of the Year: Sam Dunn, Scott McFadyen for Iron Maiden Flight 666.